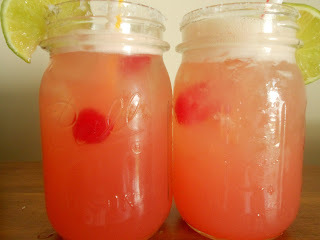 You are here: Home » Cherry Beer Margaritas!! One of the things that I love most about Pinterest is the ability to come across bloggers, and their delectable treats, I never would have known existed. This is one of those recipes! I did Mexican night on Saturday and had stumbled across this drink earlier in the am. Now, the other thing that I did on Saturday was my monthly grocery shopping. It gives new meaning to hating that time of the month, let me tell you…especially when you bring a husband in tow!! By the time I got home, I was ready to whip up a pitcher of these. My only fear is that the boys would have said they are too girly, but, honestly, at that point, I really didn’t care! Well, let me tell you, THE BOYS LOVED THEM. They actually had two, which I guess it was a good thing I only wanted one. They called them refreshing and a nice twist to Beer Margaritas I had made a while ago and that were not a hit. So, no sissy drink here!! I have kept the recipe pretty true to Amy’s recipe. The only thing I do different is add a bit of Maraschino cherry juice to the glass prior to adding the margarita mix. So, here we go! 1) Take Margarita glasses or Mason jars (which are adorable Margarita glasses to me) and do a rimmer using lime juice or sweet/sour and Margarita salt. Fill with ice and place in freezer until ready for use. 4) Remove glasses from freezer and add about a 1/2 T. of cherry juice to each glass. Pour in Margarita mix until full. 5) Garnish with straw, cherries (5) and lime slice!